Ode to Heather Galler. 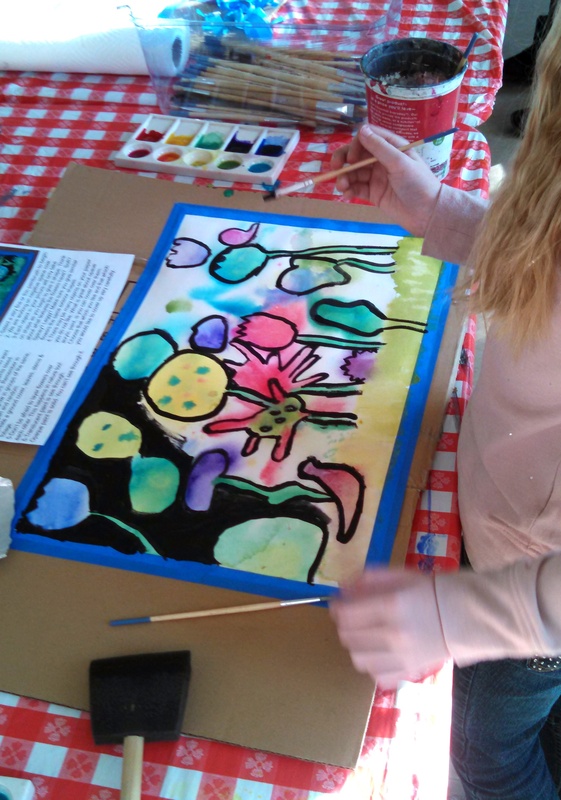 Inspiring kids to let loose and go crazy with color! 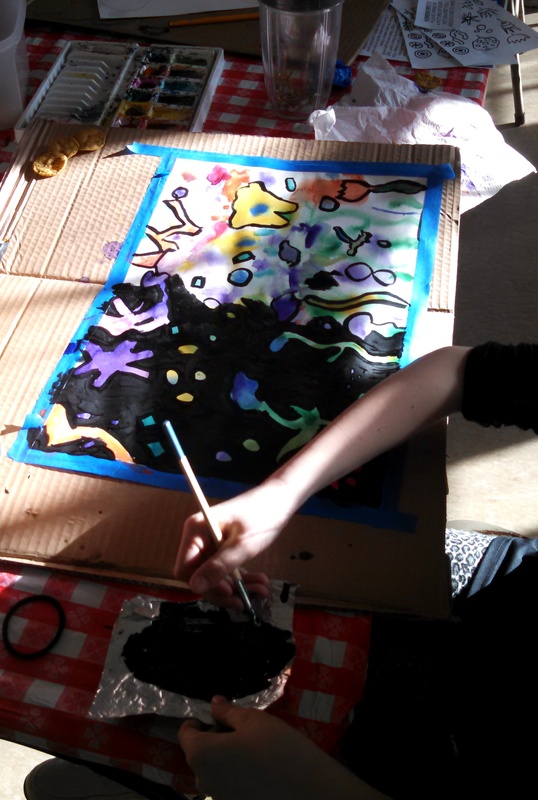 Art class show n’ tell again! 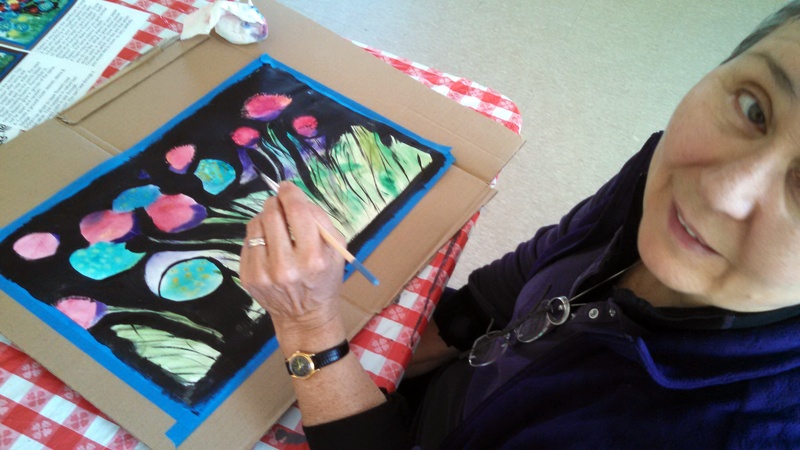 This class begins with inspiration from a New York artist named Heather Galler. 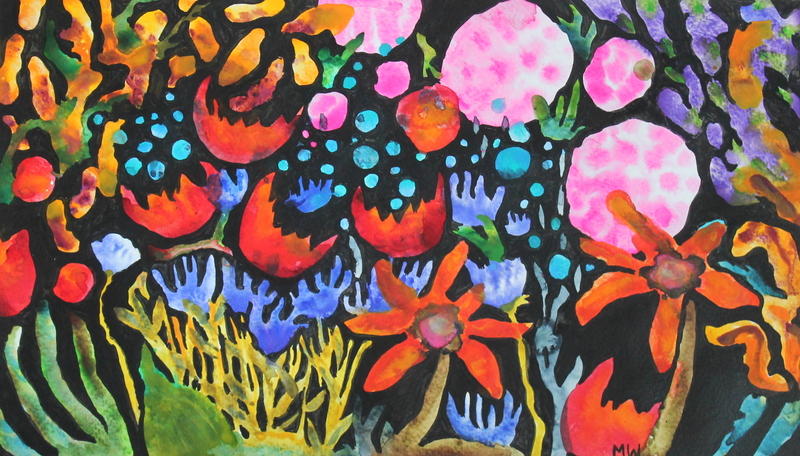 Her work is crazy colorful and adds everything but the kitchen sink. I love it! I asked the kids to bring in a picture of their pet this week. 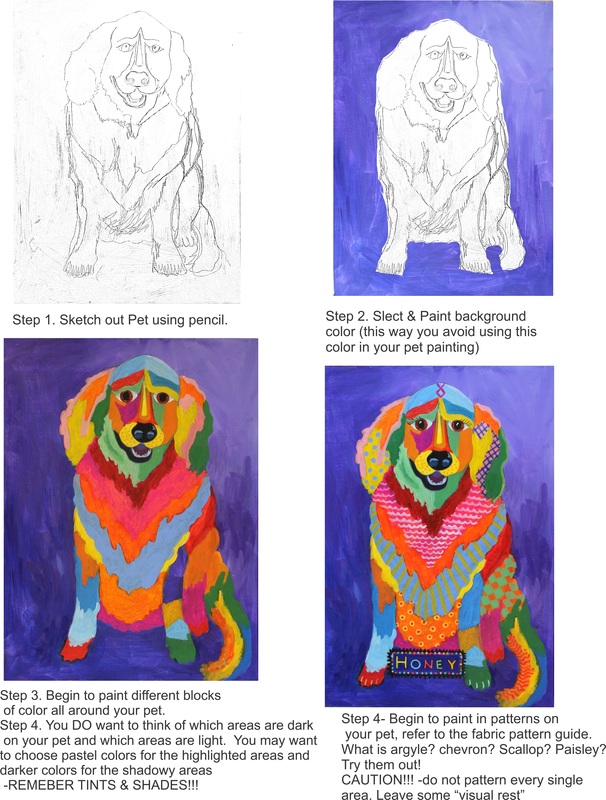 You should have seen their eyes when they realized they were somehow going to reinterpret their brown, grey and white pets into color-scapes. They were freaked! …but of course we could break it down into steps and make it do-able. 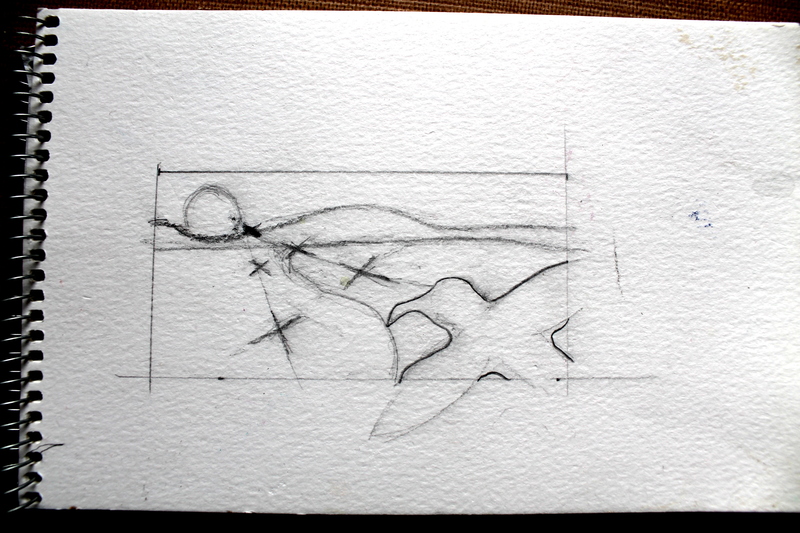 Now this is where it sort of went wrong, I didn’t really consider how long the pencil sketches were going to take. Long story short, they took up 2/3 of the class. Another miserable thing – I brought in my good camera and took some awesome shots of the kids working on their paintings. When I plugged my camera in this morning, I realized there wasn’t a memory card in the camera the entire class…UGHHHH! That is the worst experience! So in a nutshell, we sketched, we loosely sectioned off the pets into areas and started color blocking. 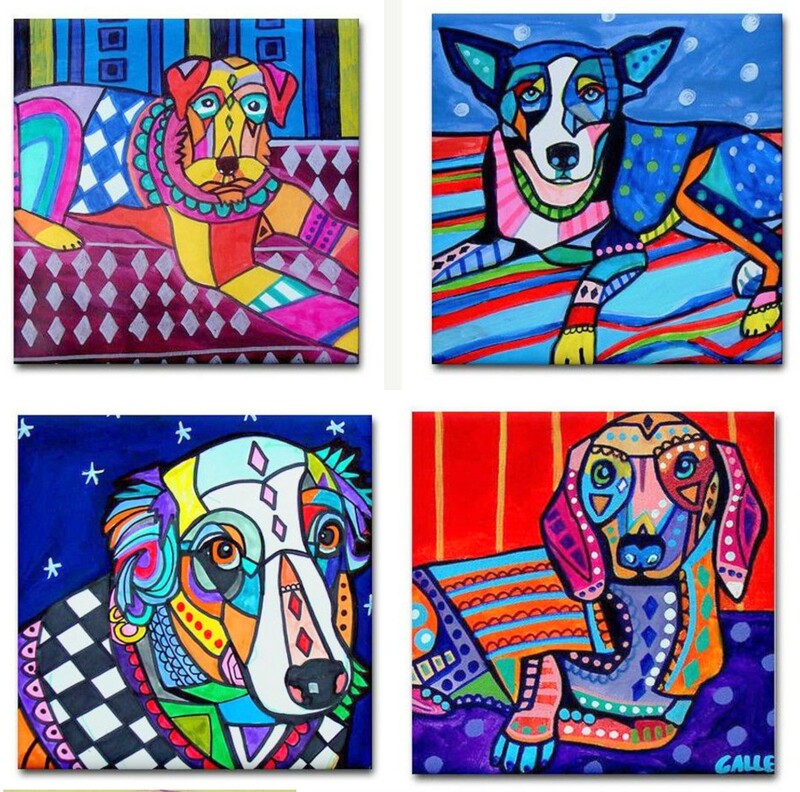 No patterns at this point, you simply fill in the animal with colors that are visually appealing. We did talk about when you might want to add tints and shades, we decided pastels and full on color would give us the same effect. Next week we will accomplish the final step. Pattern. 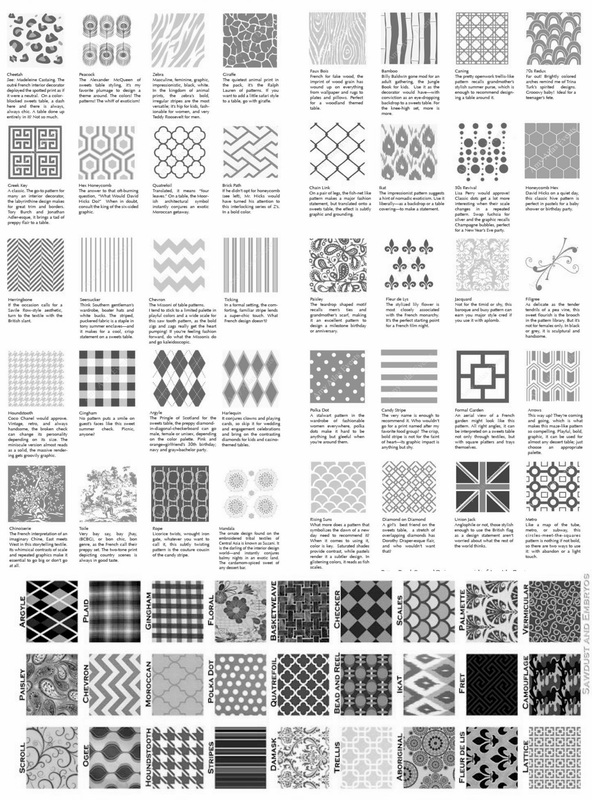 I compiled a sheet of all different fabric patterns. We talked about some of the names of patterns like hounds tooth and chevrons. It would be great if some of the names sink in…the patterns are timeless and are great design principles. 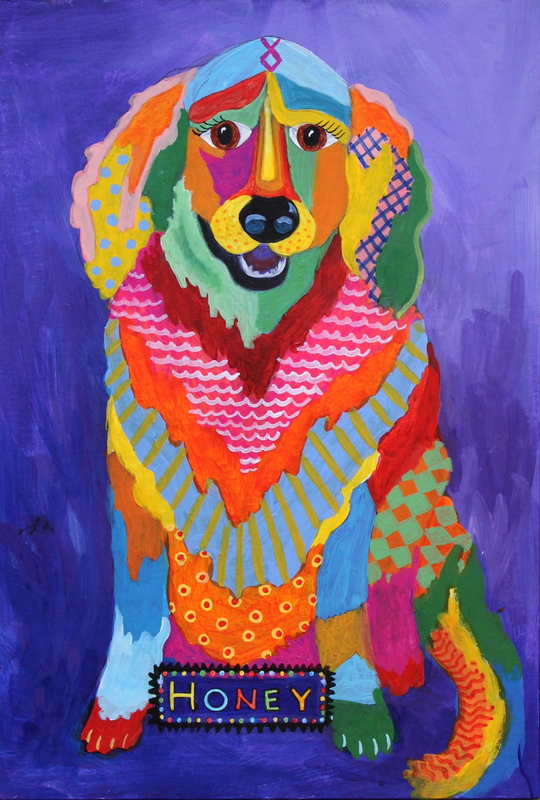 My portrait is going to some best friends who recently lost their family member, Honey, to Lyme Disease. Heartbreaking stuff. Heather Galler outlines her pets in black, but something about a Golden Retriever prevented me from doing so. They are just so soft and furry, I thought the black paint would be too harsh. We will see what my friends think, I could always add it if they thought they’d like it. I also didn’t add pattern to the background. If I was painting my cat, I think I’d go wild, but for a tribute to Honey, our quite friend who always followed, I didn’t want anything in the back to compete. Again will see if my friends want stars and stripes. I can always add more, but taking away is a bear! All in all, I have to tip my hat to Miss Galler because this exercise was way more difficult than I anticipated. Bouncing colors off each other is no easy task, I changed some sections quite a few times until I was happy with the color harmonies. 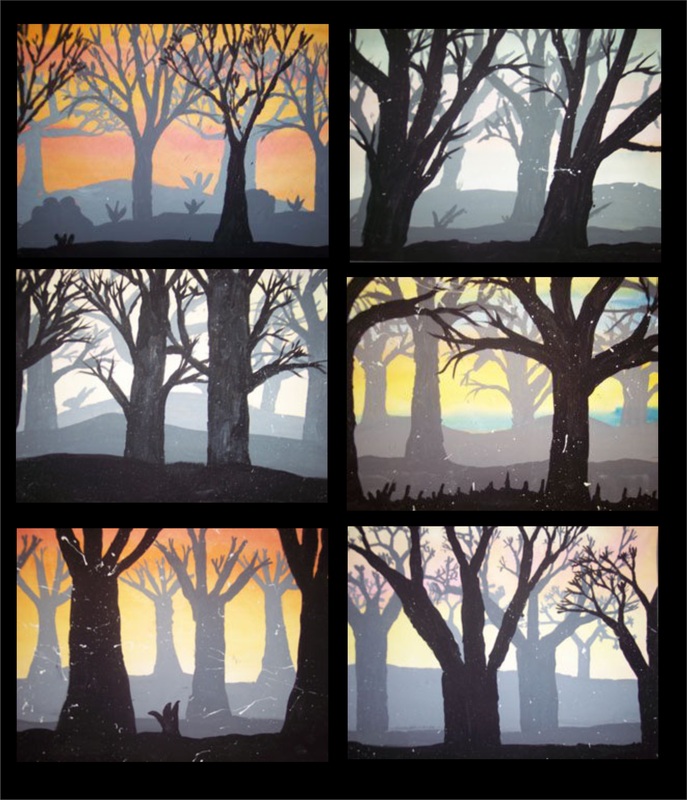 Next week is the final class of the acrylic session. I have another lesson planned, so we will have to figure out how to finish this project and still be able to start & finish another…WILL DO IT! I’m sure! 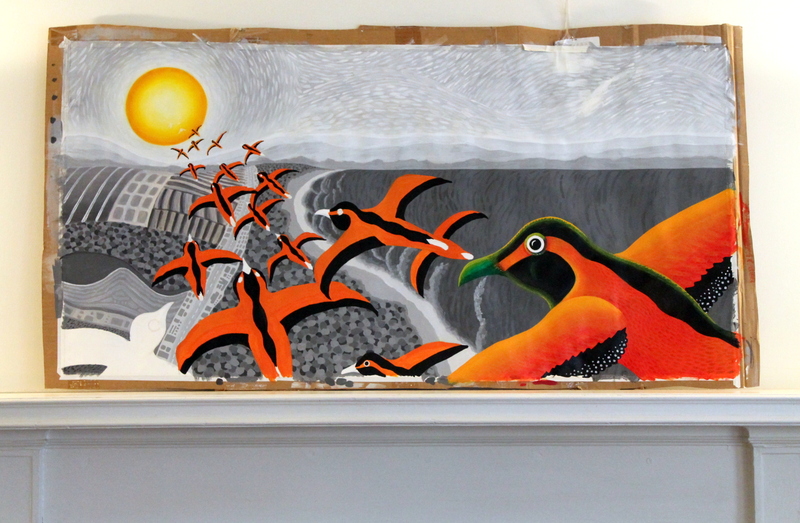 Alas my giant bird painting hanging unfinished over my mantle is coming along at a snail’s pace. I get so frustrated because there just isn’t enough time in the day. I need to go back to watercolors. They are quick and finite. Acrylic allows me to repaint an area I don’t like twenty times. It’s the definition of insanity! I spend hours on an area only to cover it up and try something else. Not fittin’ for my personality. 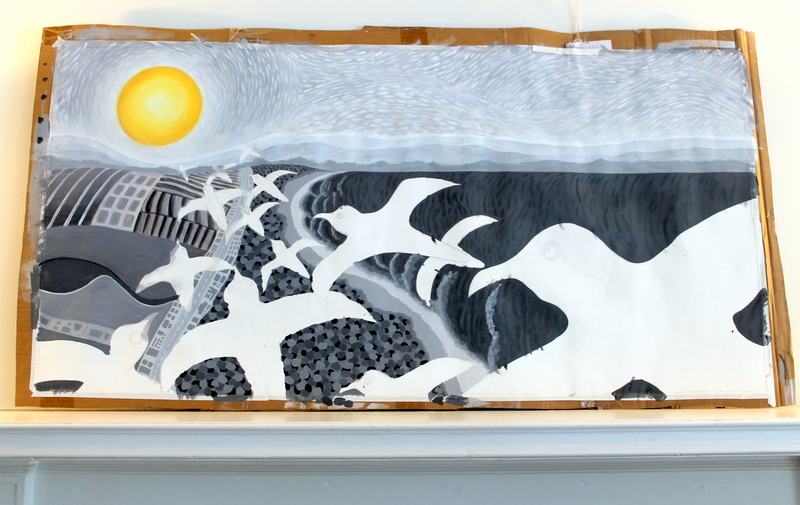 I need to be forced to hand over the painting… I hope to get this done soon! My Day-of-the-Dead skulls are finished from the pottery studio. I hope to take some pictures at the beginning of next week. They are awesomely fun! HAPPY SPRING!!! I say as we await 4 more inches of snow today in Rhode Island! 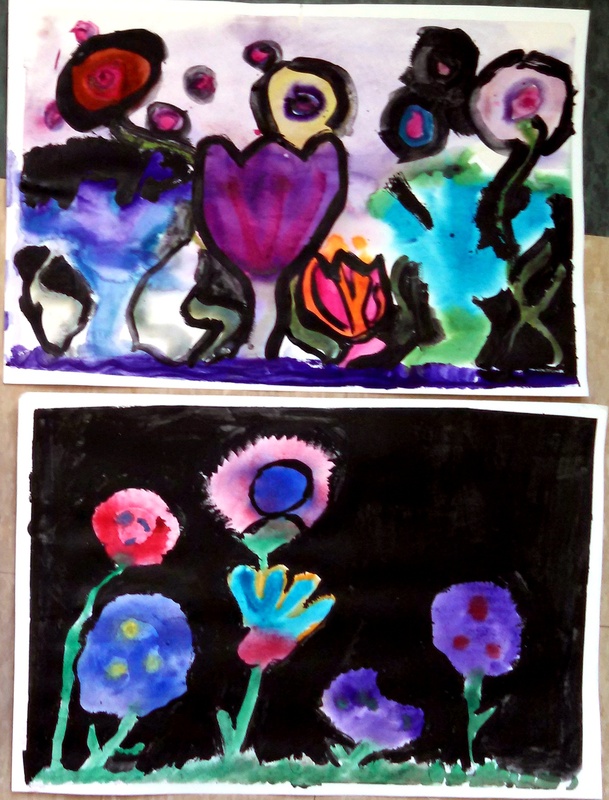 I wanted to share my weekly kids art class with you. Their work is stunning! In 2013, when I was undergoing my daily 365 challenge, I created this painting. I always loved it for its spontaneity and happy colors. It came to mind recently when I started teaching as I thought this technique has quite a few teachable moments. Each week I try the project and create notes before I have the kids do it. This way I can make sure I can conceive of all of the teaching points. 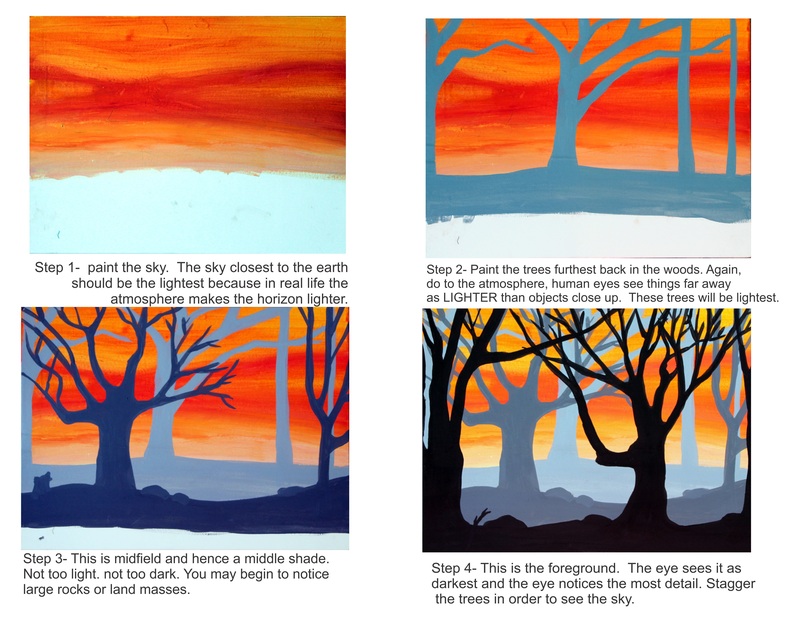 This project teaches the difference between translucent paints (commonly watercolors) and opaque paints (commonly oils and acrylics). 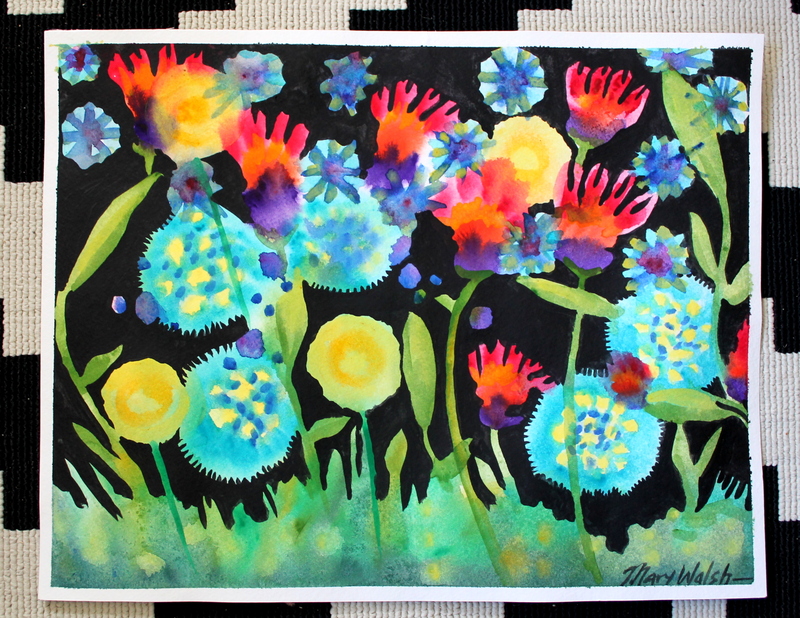 The dark opaque background makes the light flowers pop. 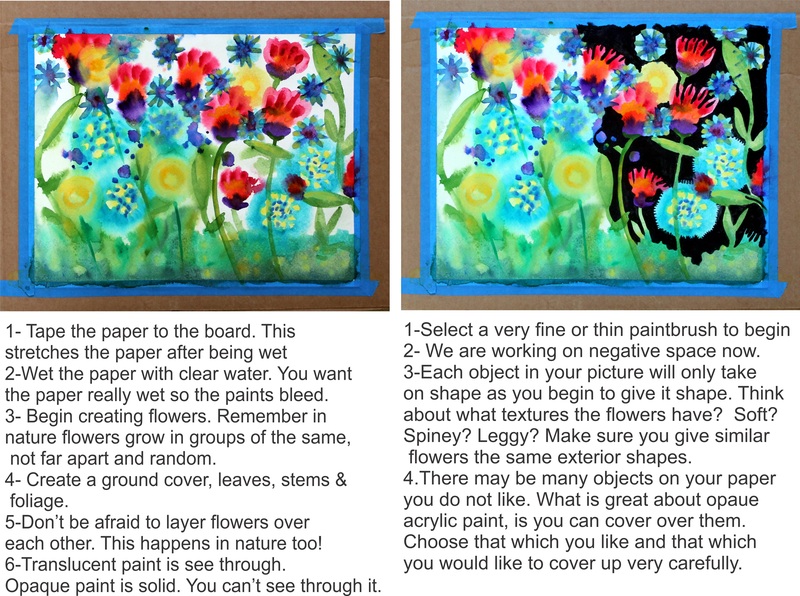 I encouraged the kids to use loads of water to keep the watercolors transparent. 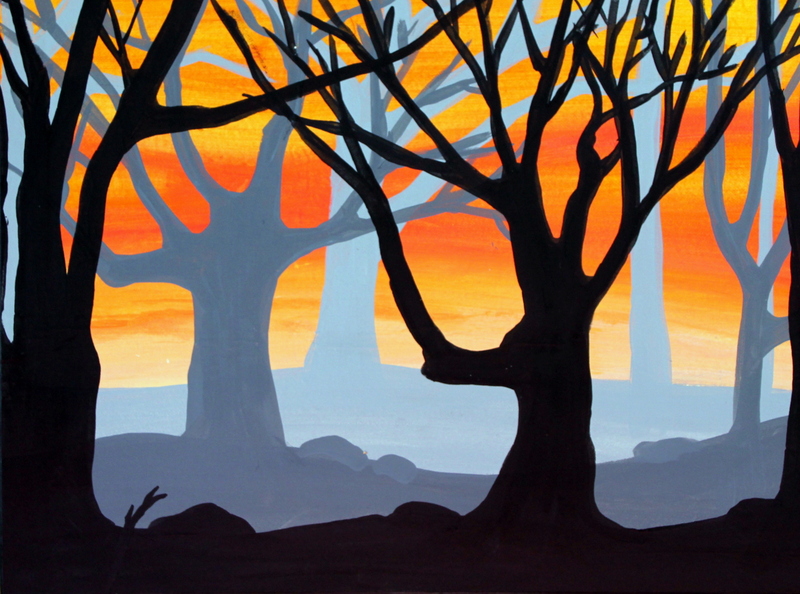 The Second lesson in this project is the concept of NEGATIVE SPACE. All good artists consider their subject matter, but they also think about the background, the shapes on the paper where the subject matter is NOT. 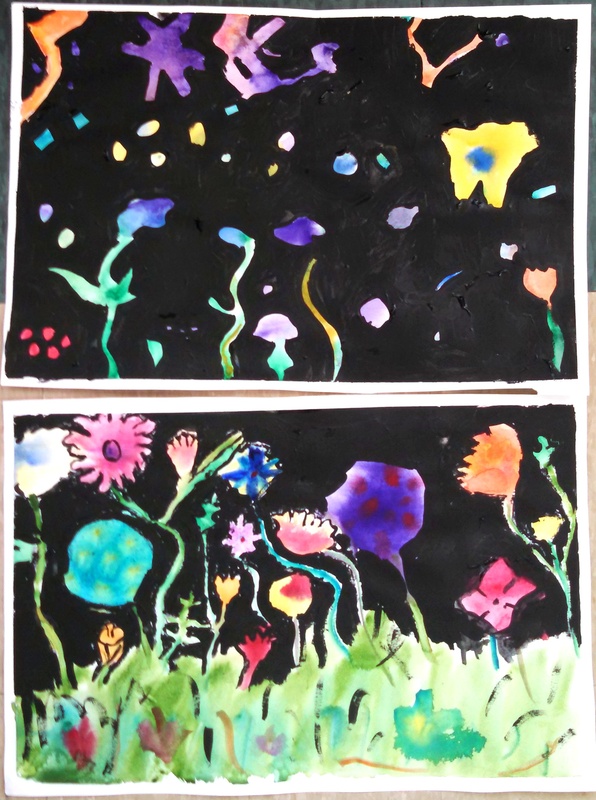 With the black paint, the kids have to go in and really think about what they want their flowers and fauna to look like. Are the black spaces around your flowers equally as interesting as the flowers? It’s important to think about this in a composition. 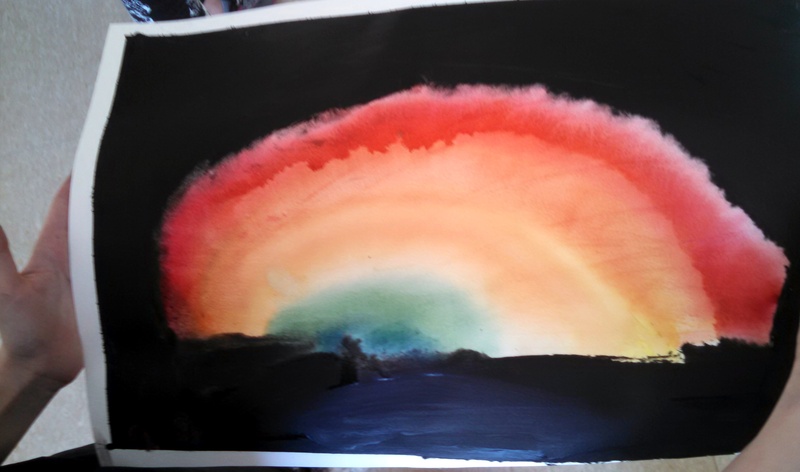 I also pointed out that the watercolor painting in itself, is sort of sloppy and all one tone. Your eye can’t really decipher where one thing begins and another thing ends. But with intense contrast, like the difference between paint that is see through and paint you cannot see through, you can distinctly manipulate your image. …and of course, THEY GOT IT!!! 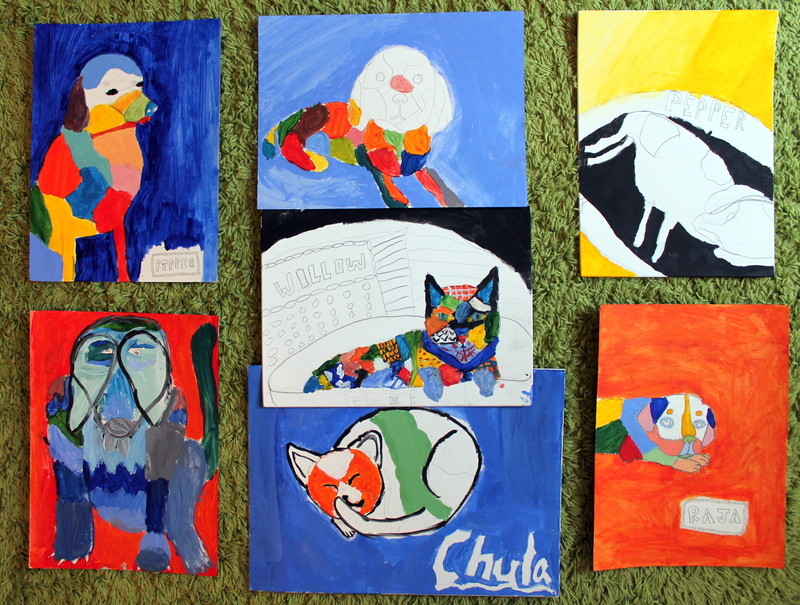 These are my students work ranging from ages 9-14. 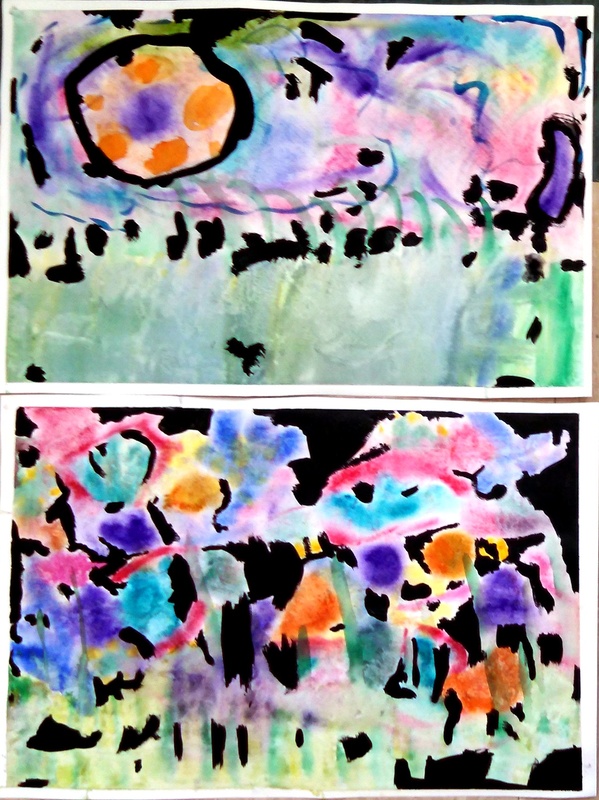 The last two paintings are interesting… The two students had a VERY HARD time adding black opaque paint to their light watercolor paintings. It freaked them out!!! They DID NOT WANT TO EDIT ANY SPACES FROM THEIR PAINTINGS. At first as a traditional adult, I thought “YOU’RE DOING IT WRONG!! !” but then the teacher in me came out and thought “who am I to tell you what your art is supposed to look like!” and then I thanked the two students for opening my eyes to a different way which was equally VERY INTERESTING! Please teachers out there… Please tell me this feeling goes away!!! and thank you to my mother-in-law for driving from far away to take part in one of my classes. That was pretty cool! 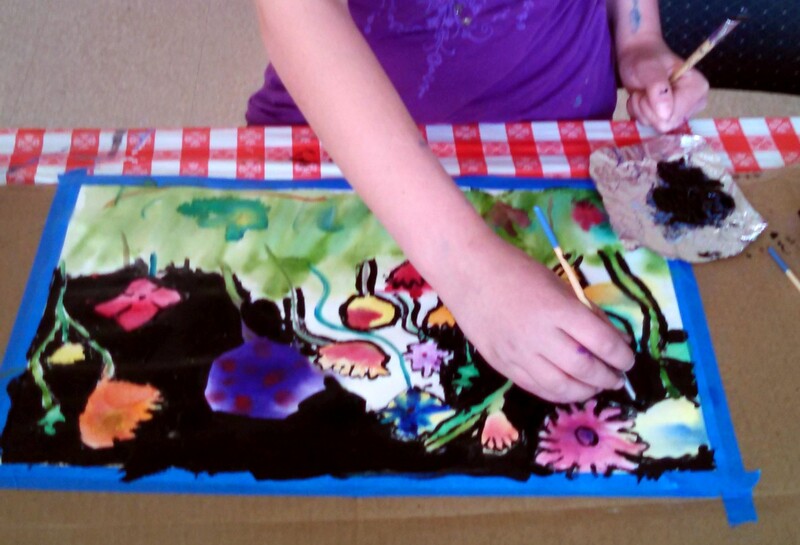 Week 2 of my acrylic painting class for kids age 9-14. Let me start by saying I research A LOT!!! My premise for this painting class is: If I don’t have fun painting the same project as an adult then I am NOT going to ask the kids to do it. The premise comes from having a 10 year old daughter who DOES NOT LIKE TO BE BABIED. She wants to paint adult stuff. She wants to be like mom. Well, that’s a tall order. These kids are 30 years younger. That’s a lot of experience they haven’t experienced yet, but I get it. I was that way too. I would love to give credit to the amazing teacher who came up with such a beautiful way to communicate a very valuable painting lesson. (<——No pun intended there, but we are speaking about VALUE and tints and shades…) However, as many times as I tried to search for who to give credit to, I kept being led down dead ends. All I could find was LAKE-MILLS. I’m assuming it’s the school? If anyone else knows anything about these images, send it to me and I will include it. These were my notes. I hand them out to the kids each week as reference. This way as I’m walking around helping different students, other kids can move ahead with a visual prompt. The lesson was about communicating distance through light, medium and dark shades. 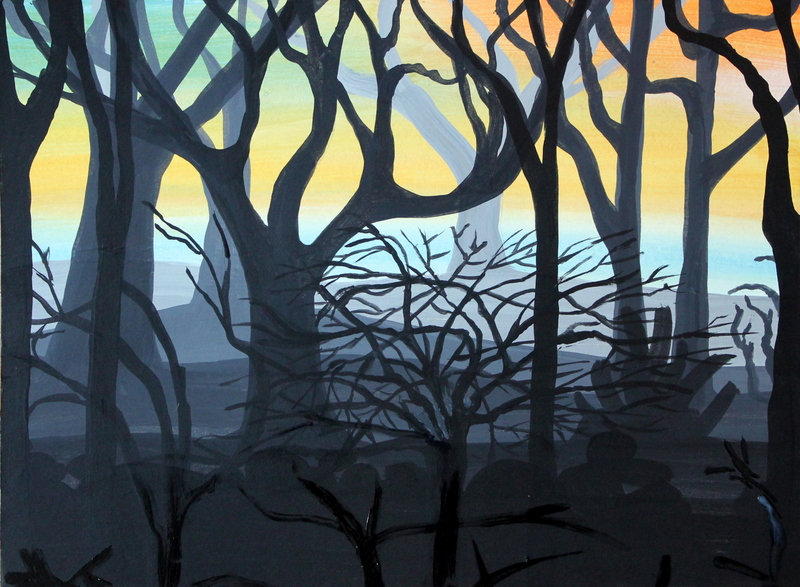 The three layers of trees are created using a lot of white paint, equal white and black, and a lot of black paint. 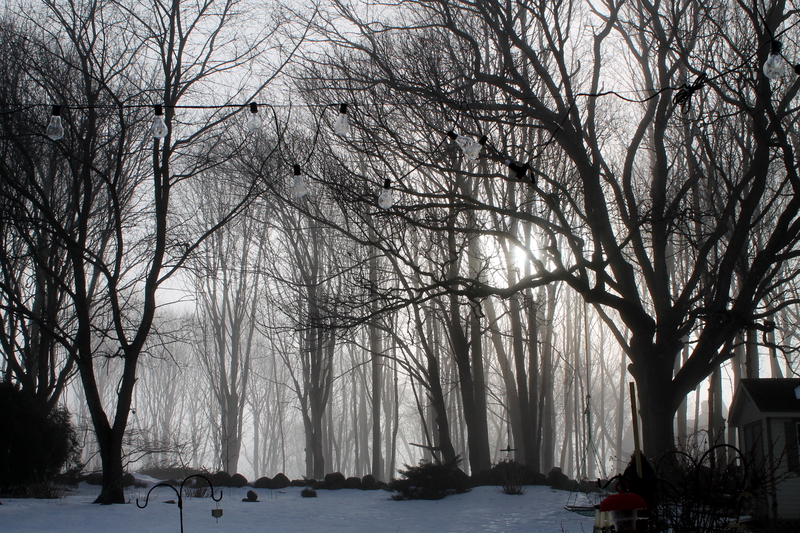 Objects in the background always appear lighter because of the gasses in our atmosphere. Unfortunately, I wasn’t fast enough to snap all the students finished projects, but they got it alright. 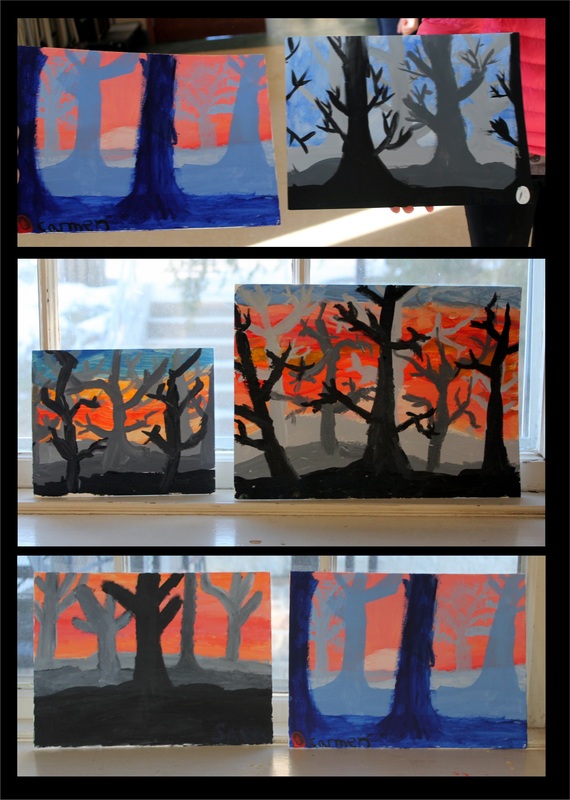 What I love about this project is that each persons interpretation of trees is entirely different. Like nature and like humanity we are all so incredibly different. So all though everyone was asked to create the same concept, each students work was entirely their own. So art teachers out there, what else you got? Do you have any other projects that are a sure-fire-hit? Do share! I have a few more up my sleeve, but I’m always looking for more! Thanks for taking the time to read my blog. It’s so cool that the internet allows us all to share creativity. 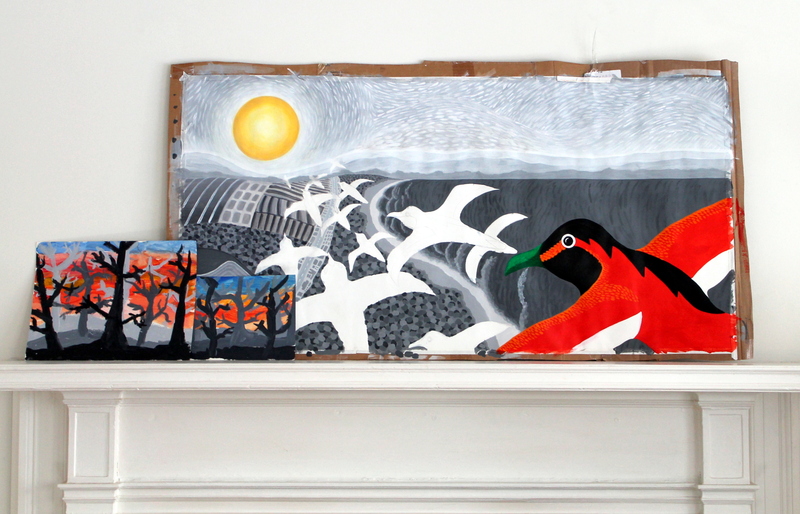 I’ve started filling in my birds…Look how cool my painting looks next to my daughter’s work. I think they will have to stay together! Can’t wait to see what manifests!